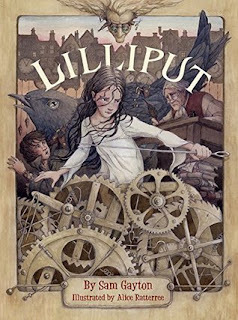 Inspired by Gulliver's Travels, Lilliput is an exhilarating adventure filled with cunning escape plans, evil clock makers, and very talkative parrots. Join Lily as she travels through 18th century London over rooftops, down chimneys, and into chocolate shops on a journey to find the one place in the world where she belongs...home. To post a comment, please click in the comment box, write your comment and sign "- Your First Name and Last Initial " at the end. If you could go anywhere in a great CLASSIC story, where would you go and why?